In a meadow in Africa , a lion was eating food . Suddenly a hawk flying low and grabbing food lion belongs . " Brash " said the lion . Jungle king was very angry that ordered all the animals to come together and declared war against the birds .
" From now on any kind of bird is our enemy " , get rid of them all , do not be spared , "said the Lion . Other animals agreed because they felt had treated the same by the bird nation . When the night starts to fall , the nation's bird returned to the nest . The opportunity was used by the Lions and his men to attack . The birds fled in disorder . Fortunately, there is still an owl can see clearly at night so that they could all escape from a lion attack and his men . Seeing the nation lost birds , the bats feel anxious , so she hurried to see the king of the jungle . Bats said , "Actually, I'm including the rat race , even though I had wings . So allow me to join your group, I would risk my life to fight against the birds " . Without thinking lion was approved bats go in the group . The next night a group led by a lion attacking the birds back and managed to throw him out . The next day , early in the morning , when a group of lions is resting behind a group of birds attacking them with a group of lions pelted with stones and nuts . " Beware of hail, " shouted the group of animals with a lion escaped . The bat felt anxious about these things so that he minded to re- join the group of birds . He met the king of birds eagle bird . " Look at my wings , this bird I like you " . Eagle bat gladly accept . The battle continues , the monkeys riding an elephant or rhino holding a bow and arrow . Their heads are covered with a hat from coconut shell that does not work stoned . After winning the lion group , what do bats ? . He was back and forth to side with the winning team . 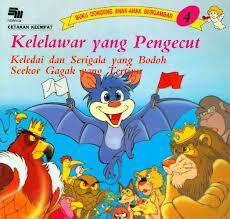 Cowardice and not opinionated owned bat gradually known by both groups lion and bird groups . They realized that there was no point in mutual hostility . And they are friends again and decided to evict bats from their environment . Bat felt so ashamed that he hid in dark caves . He just appeared when night came by way of stealth.